Congratulations to Jeff Lisandro, Event #37 Champion! The final table of Event #37, $10,000 World Championship Seven Card Stud Hi/Lo 8-or-better, seemed like it was never going to end, but finally it has. Just over three and a half hours after entering heads-up play, Jeff "Iceman" Lisandro has emerged victorious over Farzad Rouhani. When play got down to the final two contestants, Lisandro was behind, but fought back to regain the chip lead through winning numerous small pots. From there, he hammered on Rouhani over and over to grind him down to almost nothing. After a few all-ins and some chopped pots, it seemed only a matter of time before Lisandro would close the deal. Lisandro claims his second gold bracelet of this year's World Series of Poker and further proves that he is one of the best seven-card stud players in the game. Along with his bracelet comes a nice hefty payday of over $430,000. 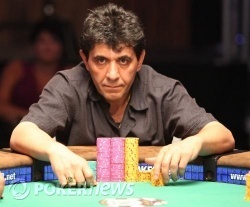 Lisandro has earned over half a million dollars at this year's WSOP already. 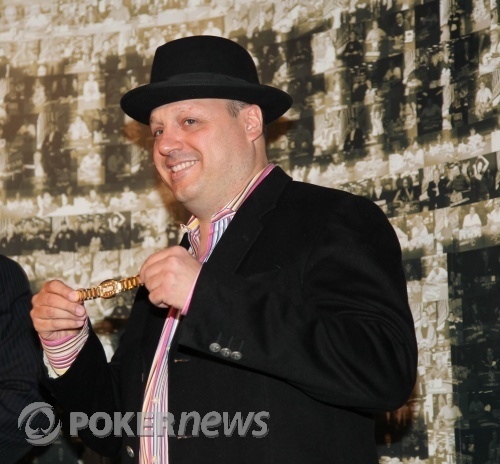 Congratulations to Jeff Lisandro on winning Event #37 and claiming his second gold WSOP bracelet this year! Farzad Rouhani Eliminated in 2nd Place ($266,804), Jeff Lisandro Wins! Farzad Rouhani had the bring-in, Jeff Lisandro completed, Rouhani raised, Lisandro made it three bets, Rouhani made it four bets, and Lisandro called. Both players checked fourth street. Lisandro bet out on fifth and Rouhani called all in. Rouhani had a low draw and a gutshot wheel draw while Lisandro led with two pair, tens and sixes. Rouhani bricked on sixth and seventh, and finally succumbed after a 15-hour plus day of poker. For his runner-up finish, he earned $266,804. 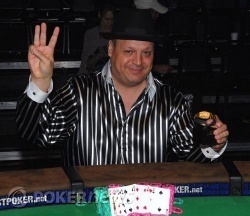 Jeff Lisandro is our Stud Hi/Lo World Champion, earning his second bracelet of the 2009 WSOP and his third overall. He'll take home $431,656. All of the money went in on fifth street. Farzad Rouhani turned over for a pair and four to a spade flush. Jeff Lisandro turned over for a pair of jacks and three to a low. Rouhani picked up a second pair on sixth and it was good enough to hold after Lisandro bricked out with the followed by the . He doubled up to about 800,000. Rouhani got the rest of his chips in on third street. Though Lisandro was scooping up until sixth street, Rouhani made two pair on the river with tens and fives. Lisandro had an 8-7-6-3-A low and they split the pot. Rouhani brought it in, Lisandro completed and Rouhani made the call. Lisandro led out on fourth street and Rouhani came along. Both players checked on fifth street when they paired up. Lisandro then bet out on sixth, getting a fold from Rouhani. Rouhani is down to 450,000.